As increased access attracts inexperienced trekkers, will disaster strike more frequently in the Himalayas? The night before going over Thorung La, the 17,769 foot pass that would be the high point of our 19 day trek around the Annapurna Circuit, we lounged comfortably at the last major guest house in Thorung Phedi. The next guest house was in Muktinath, about 10 miles away. American pop music filled the large dining hall, almost making me forget where we were – more than 14,400 feet above sea level, high in the Himalayas, surrounded by steep scree slopes and herds of blue sheep. As we sat talking with fellow trekkers who came from points around the globe, our conversation focused on travel, places we had been, and trails we had hiked. Photo by Sean Currens. 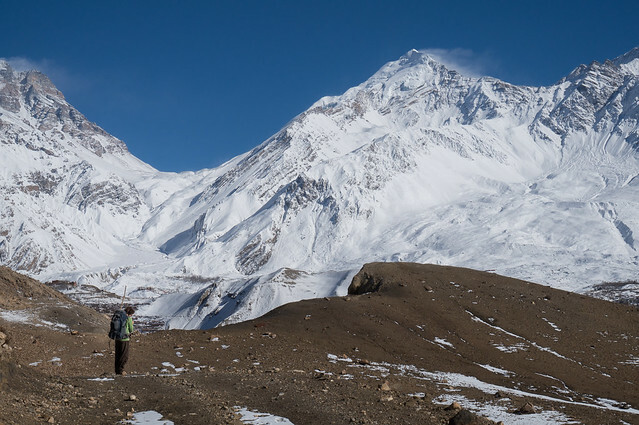 A hiker gazes at a snow covered Thorung La in February. When my friend Blake, who I had met three years earlier thru-hiking the Appalachian Trail, invited me to join him on the Circuit, I imagined us huddled around open stoves in candlelit, thatched roof huts with only a small handful of weathered hikers for company. The words themselves – Nepal, Himalaya, Annapurna – seemed exotic, distant and remote, and quixotic notions of a land untouched by the modern world occupied my mind. In reality, the Annapurna Circuit was a far cry from the romantic illusions that had filled my head in the weeks preceding our departure. Made up of trails stomped out over centuries of travel and trade between villages, the Circuit was only formed as a cohesive “trail” open to recreationists in the late 1970s. Since then, the Circuit has gained a reputation as the ultimate trek, and its accessibility has increased along with its popularity. Today, a rough jeep road parallels a majority of the trail, health care facilities have opened in a handful of towns along the route, Snickers bars and Coca-Cola are available for purchase at just about every wayside and guest house, wi-fi connections are common, and local communities have become quite savvy in their attempts to cater to western clients. The extensive planning process usually required for long hikes – poring over maps, noting water sources, scheduling food drops or resupplies, and coordinating gear – has been practically eliminated. Book a flight to Kathmandu, take a bus to Pokhara, hire a guide and take off. Photo by Sean Currens. Trekkers find a 7-Eleven on the Circuit. The Circuit’s growing accessibility has attracted more travelers with less hiking experience. Few of the trekkers we met in our Thorung Phedi guest house had ever backpacked previously, and none had done any long-distance hiking. Most had porters to carry their gear or relied on a guide to plan each day of their trip. 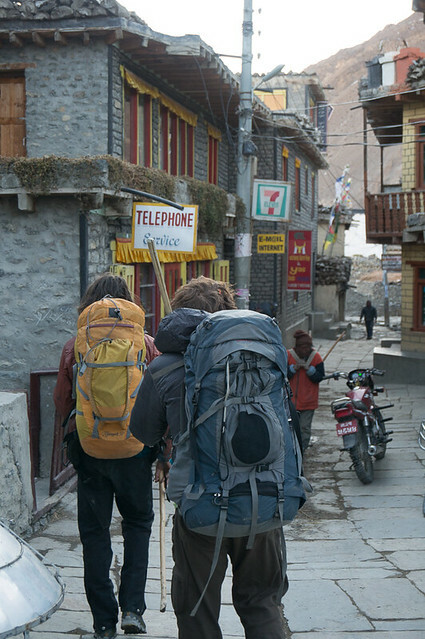 For many of these travelers, hiking in Nepal wouldn’t have been possible if not for this assistance, which decreases the amount of gear, knowhow, and self-sufficiency that such treks typically require. This dependence was on my mind throughout the trip, as it struck me as antithetical to everything I love about hiking. When we awoke the next morning ready to tackle the pass, a thick fog hung over the valley. These conditions were far from perfect, but the cooler temperatures made for good hiking weather, and we moved quickly. Visibility was limited, and for the first time, our path wasn’t obvious. We no longer had the benefit of the steep valley whose vertical walls made the way obvious, and instead, the trail snaked up and around glacial moraines that were barren of any distinguishing features. It felt like a moonscape, and I couldn’t help but think how difficult the trail would be to navigate with even a slight dusting of snow. And it was on this same section of trail, just three weeks later, that dozens of trekkers were forced to make life or death decisions when an unseasonal blizzard struck, trapping more than one hundred of them and ultimately resulting in death of at least 40. It didn’t occur to me at the time, but we were lucky. Farther away from a road than we had been at any time during the trip, the clouds remained with us, but the weather held and allowed us to spend two hours at the Thorung La, reveling in our achievement. In retrospect, that overcast day could have easily turned for the worse. If that had happened, like it did three weeks later, what would I have done? I have no answer for that question. I want to believe that caution and experience would have gotten me through the storm, but the more I think about it, the less confident I am. On our way down to Muktinath, we caught up with a group that had been with us at Phedi the previous night. No one in the group had much experience, but only one member, a young French woman, seemed out of place. The elevation had given her difficulties on the way up, but even after the trail had dropped to more oxygen-rich heights, she stumbled along with an air of indifference that lacked the purpose or deliberation that generally characterizes a hiker’s gait. Her walk looked more fitting for a sunny spring day along the Champs-Elysees than a challenging trek through the Himalayas. Her fashionable jeans and casual sneakers seemed bizarre, and the small backpack she carried reminded me of mine from seventh grade. The fact that she stood in front of me was mind boggling, but the more I thought about it, the more I realized she was closer to the norm than me. Yes, the trail was often steep and rough, it rained, the extreme altitudes could make tying one’s shoes an aerobic activity, leeches dropped from trees with an uncanny ability to land on human calves, and the 75 miles we had covered thus far all combined to ensure plenty of hardship. But at the same time, the frequent guest houses, fresh apple pie, and throngs of other trekkers created a comfortable, secure environment and made the hike easy in many ways. These amenities also made the hike more appealing to the less-skilled trekkers among us. Though the young French woman was in over her head, sore muscles and a headache were probably the greatest discomforts she would have to endure. So when I heard about the blizzard, I couldn’t help but think of her, and wonder what would have happened if she had met more extreme conditions. Going into the mountains is inherently dangerous. The wealth of modern facilities and increased accessibility have combined to create a sense of security among trekkers along the trail. But as this recent tragedy has taught us, the most alluring features of the Circuit remain intact: The Himalayas are rugged and wild, and require skills that no smartphone or guidebook can replace. Hiking over a hundred miles through the world’s tallest mountain range still presents challenges that can humble anyone, and it’s important we remember that. Since the disaster, the Nepalese government has pledged to install better warning systems for trekkers, but that isn’t the answer. Finding one more way to plug hikers into the modern world will just provide another crutch and increase the false sense of security that dissuades people from thinking critically and making decisions on their own. For me, the joy of backpacking comes from leaving the comforts of the modern world, which coddle us and encourage dependence. It is exhilarating to know that the limited amount of gear on my back and knowledge in my head will dictate my survival. No one should be dissuaded from a trip around the Annapurna Circuit, but let this tragedy be a reminder that despite increased accessibility, the Himalayas are still an untamed landscape. And while even a seasoned trekker can find him or herself at the mercy of the mountains, the best way of preventing future tragedies is to be always mentally and physically prepared for the unexpected.